Download "Ministry of Defence. 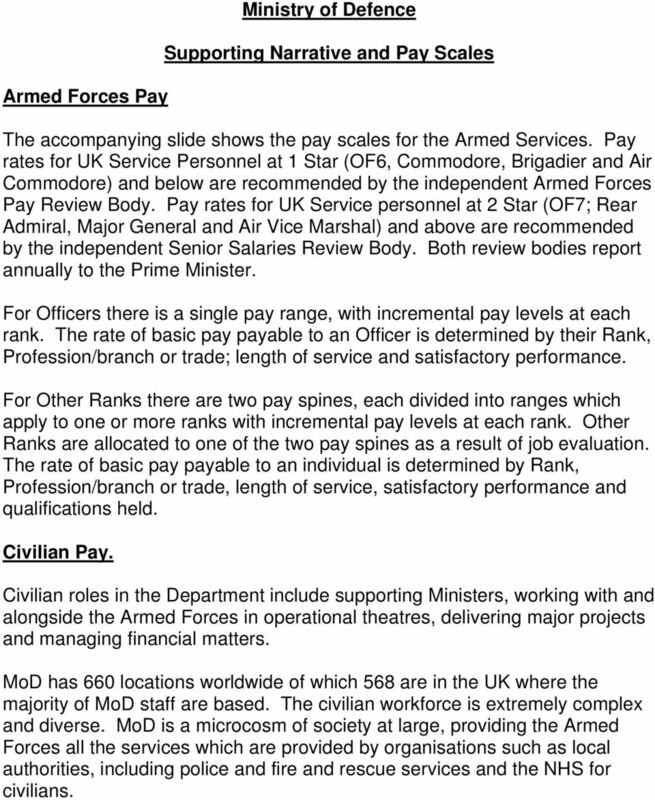 Supporting Narrative and Pay Scales"
1 Armed Forces Pay Ministry of Defence Supporting Narrative and Pay Scales The accompanying slide shows the pay scales for the Armed Services. Pay rates for UK Service Personnel at 1 Star (OF6, Commodore, Brigadier and Air Commodore) and below are recommended by the independent Armed Forces Pay Review Body. Pay rates for UK Service personnel at 2 Star (OF7; Rear Admiral, Major General and Air Vice Marshal) and above are recommended by the independent Senior Salaries Review Body. Both review bodies report annually to the Prime Minister. For Officers there is a single pay range, with incremental pay levels at each rank. The rate of basic pay payable to an Officer is determined by their Rank, Profession/branch or trade; length of service and satisfactory performance. For Other Ranks there are two pay spines, each divided into ranges which apply to one or more ranks with incremental pay levels at each rank. Other Ranks are allocated to one of the two pay spines as a result of job evaluation. The rate of basic pay payable to an individual is determined by Rank, Profession/branch or trade, length of service, satisfactory performance and qualifications held. Civilian Pay. Civilian roles in the Department include supporting Ministers, working with and alongside the Armed Forces in operational theatres, delivering major projects and managing financial matters. MoD has 660 locations worldwide of which 568 are in the UK where the majority of MoD staff are based. The civilian workforce is extremely complex and diverse. MoD is a microcosm of society at large, providing the Armed Forces all the services which are provided by organisations such as local authorities, including police and fire and rescue services and the NHS for civilians. 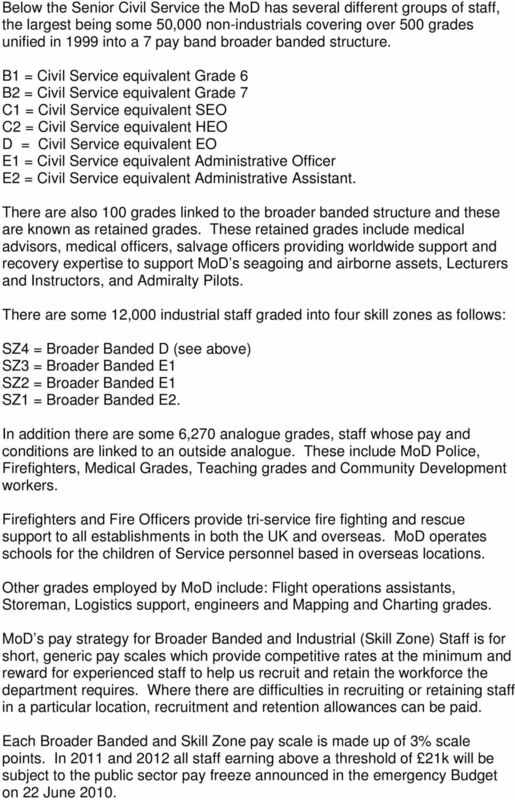 2 Below the Senior Civil Service the MoD has several different groups of staff, the largest being some 50,000 non-industrials covering over 500 grades unified in 1999 into a 7 pay band broader banded structure. B1 = Civil Service equivalent Grade 6 B2 = Civil Service equivalent Grade 7 C1 = Civil Service equivalent SEO C2 = Civil Service equivalent HEO D = Civil Service equivalent EO E1 = Civil Service equivalent Administrative Officer E2 = Civil Service equivalent Administrative Assistant. There are also 100 grades linked to the broader banded structure and these are known as retained grades. These retained grades include medical advisors, medical officers, salvage officers providing worldwide support and recovery expertise to support MoD s seagoing and airborne assets, Lecturers and Instructors, and Admiralty Pilots. There are some 12,000 industrial staff graded into four skill zones as follows: SZ4 = Broader Banded D (see above) SZ3 = Broader Banded E1 SZ2 = Broader Banded E1 SZ1 = Broader Banded E2. In addition there are some 6,270 analogue grades, staff whose pay and conditions are linked to an outside analogue. These include MoD Police, Firefighters, Medical Grades, Teaching grades and Community Development workers. Firefighters and Fire Officers provide tri-service fire fighting and rescue support to all establishments in both the UK and overseas. MoD operates schools for the children of Service personnel based in overseas locations. Other grades employed by MoD include: Flight operations assistants, Storeman, Logistics support, engineers and Mapping and Charting grades. MoD s pay strategy for Broader Banded and Industrial (Skill Zone) Staff is for short, generic pay scales which provide competitive rates at the minimum and reward for experienced staff to help us recruit and retain the workforce the department requires. Where there are difficulties in recruiting or retaining staff in a particular location, recruitment and retention allowances can be paid. Each Broader Banded and Skill Zone pay scale is made up of 3% scale points. In 2011 and 2012 all staff earning above a threshold of 21k will be subject to the public sector pay freeze announced in the emergency Budget on 22 June 2010. 3 Government policy requires that an element of pay is performance related. MoD operates a system of non-consolidated performance awards linking such payments directly to performance against objectives. Analogue grades are groups of staff such as medical grades, teachers, MoD Police and Fire Service personnel whose terms and conditions of service, including pay, broadly follow whatever arrangements apply to the external analogues. Locally engaged civilians are employed by MoD in overseas locations and their pay and other terms and conditions of service are negotiated locally in line with local market conditions. 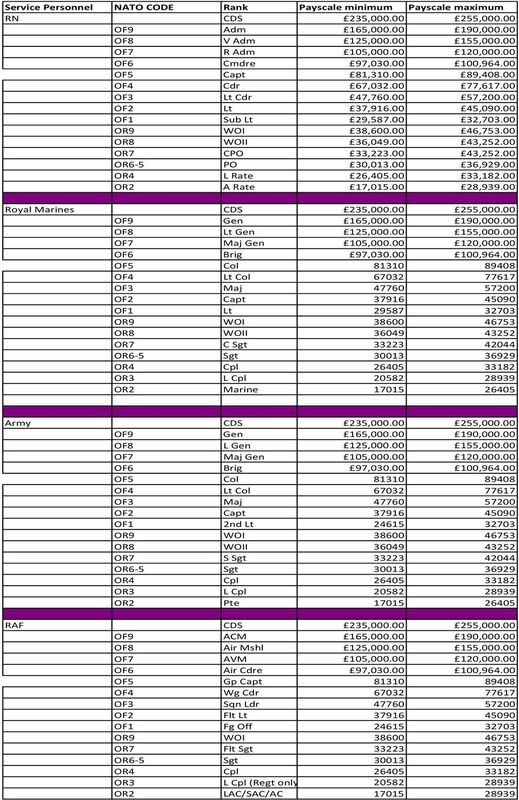 The Trading Fund Agencies have separate delegated pay and grading arrangements below the SCS. The pay ranges for the Broader Banded grades are included below as are the ranges for the Skill Zone (Industrial Grades.) These scales cover around 68% of the total workforce. 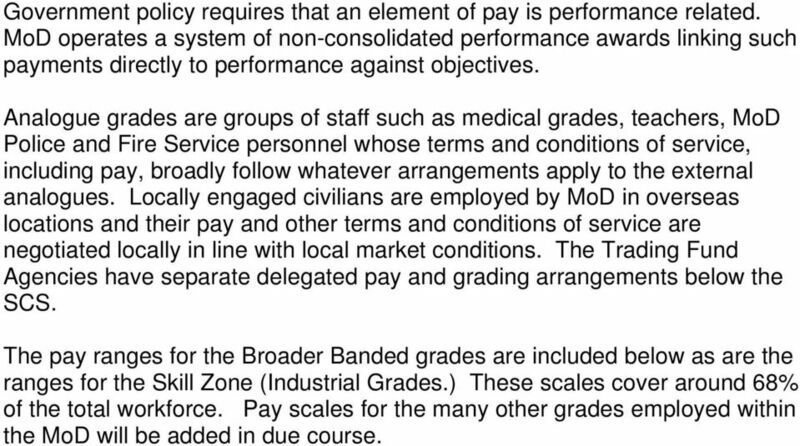 Pay scales for the many other grades employed within the MoD will be added in due course. 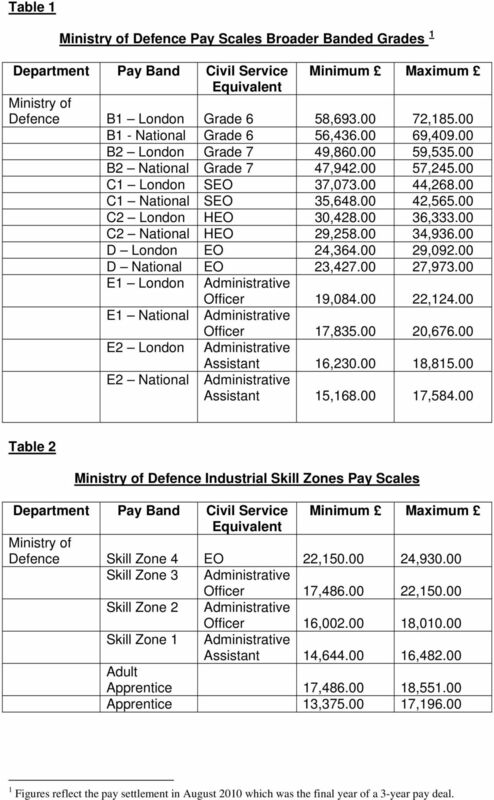 4 Table 1 Ministry of Defence Pay Scales Broader Banded Grades 1 Department Pay Band Civil Service Minimum Maximum Equivalent Ministry of Defence B1 London Grade 6 58, , B1 - National Grade 6 56, , B2 London Grade 7 49, , B2 National Grade 7 47, , C1 London SEO 37, , C1 National SEO 35, , C2 London HEO 30, , C2 National HEO 29, , D London EO 24, , D National EO 23, , E1 London Administrative Officer 19, , E1 National Administrative Officer 17, , E2 London Administrative Assistant 16, , E2 National Administrative Assistant 15, , Table 2 Ministry of Defence Industrial Skill Zones Pay Scales Department Pay Band Civil Service Minimum Maximum Equivalent Ministry of Defence Skill Zone 4 EO 22, , Skill Zone 3 Administrative Officer 17, , Skill Zone 2 Administrative Officer 16, , Skill Zone 1 Administrative Assistant 14, , Adult Apprentice 17, , Apprentice 13, , Figures reflect the pay settlement in August 2010 which was the final year of a 3-year pay deal. 3 The tables are compiled in a tri-service format based on NATO grade codings. The key to their equivalent ranks is shown here. A GUIDE TO THE MILITARY CORRECTIVE TRAINING CENTRE. 1. The Military Corrective Training Centre (MCT C) is located in Colchester, Essex. Partnered Professional Development A Joint Strategy for the Future of Military Logistics Overview The UK Armed Forces have a justified reputation in combat for their professionalism, bravery and success. Pay Policy Statement 2015-16. 1 st February 2015.